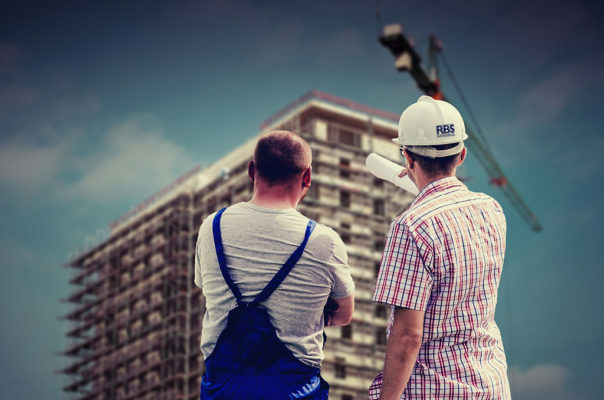 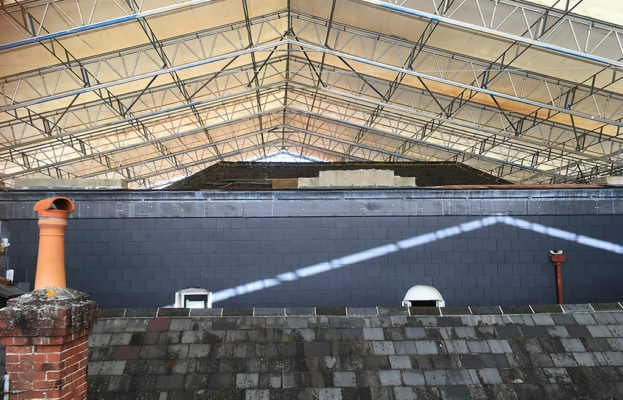 We specialise in providing Temporary Roof Structures when required for all types of buildings and projects ranging from fire damage to complete re-roofs and even refurbishment of naval radar masts. 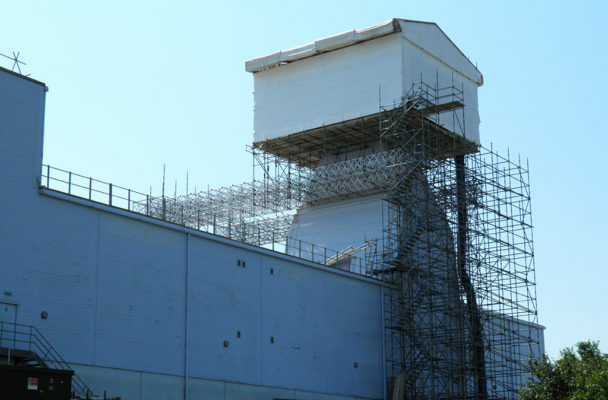 Scaffolding in this sector has seen dramatic evolutionary changes over the years. 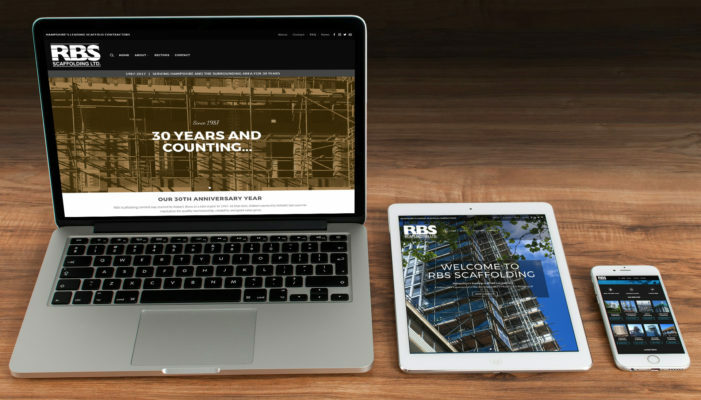 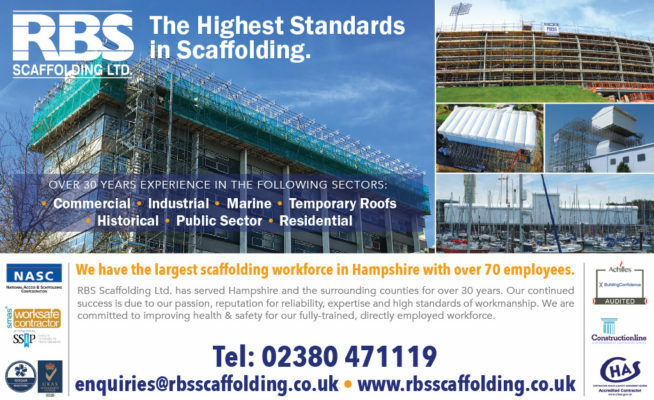 RBS have kept up to date with the most innovative, efficient and safe solutions available to make sure we can provide Temporary Roofs specific to your needs. RBS utilises the HAKITEC 750 Roof System as our preferred method. This system can be tailored to any structure and is lightweight, safe, fast and easy to erect, providing maximum protection against the elements or helping to contain hazardous materials. 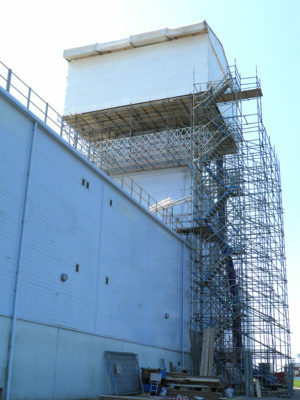 Compatible with all types of scaffolding, it can be moved quickly and easily. 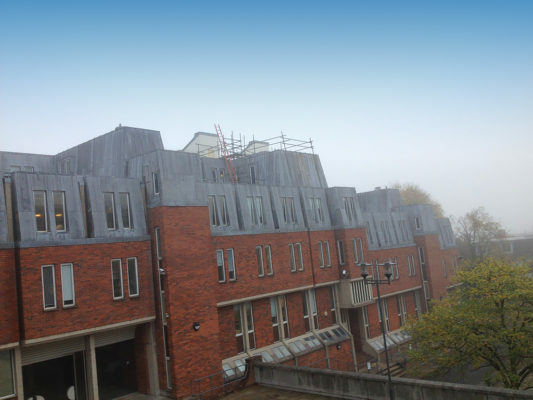 It is versatile – ridged, mono-pitch or polygonal roofs can all be configured. 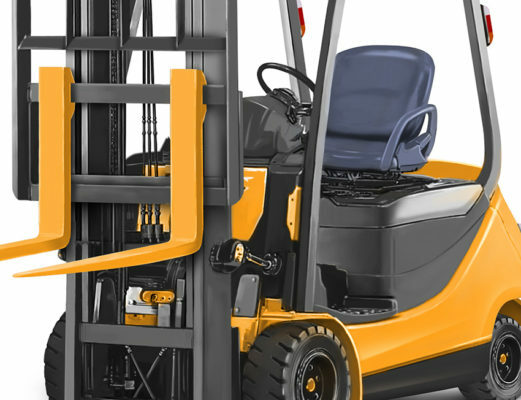 It is adaptable to suit specific structures and requirements and can accommodate planned and unplanned openings to the work area as required. 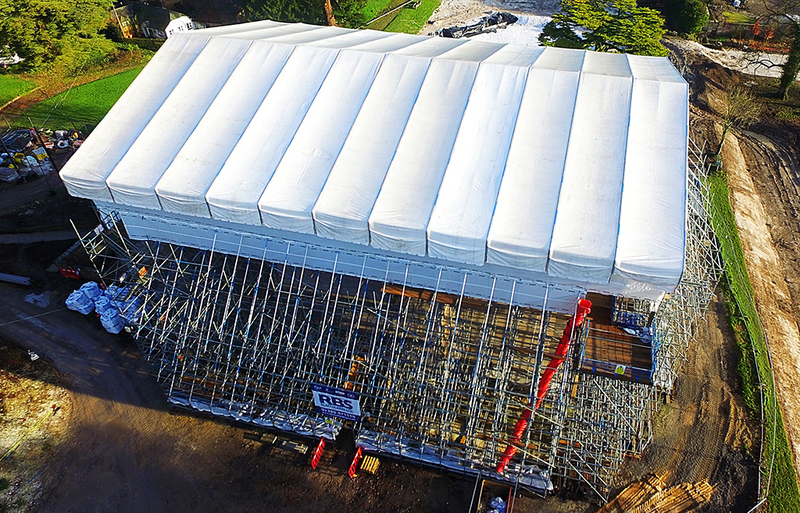 The HAKITEC 750 Roof System option is considered to be the safest and most flexible option available and is the first choice for static, mobile or crane-lifted structures. RBS started work on Chettle House (a red-brick Queen Anne manor house), designed by architect Thomas Archer for George Chafin in 1710. 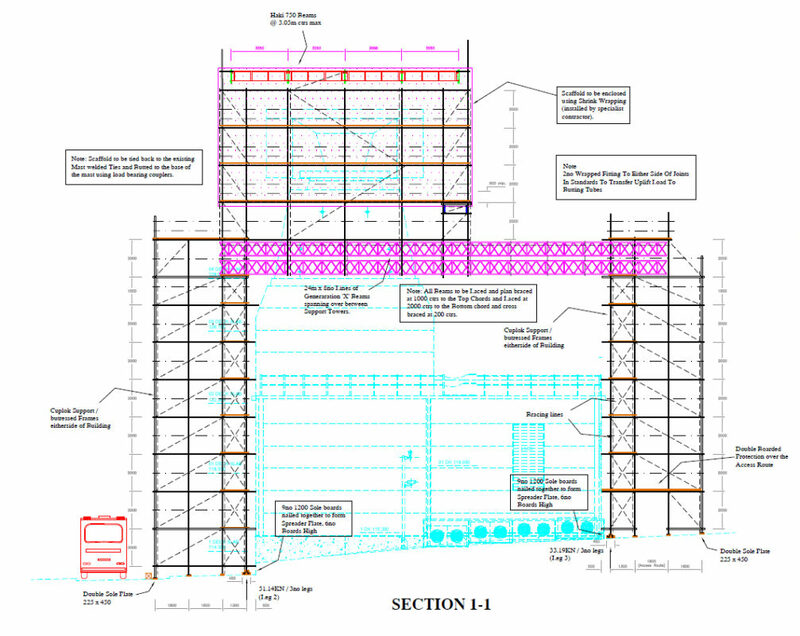 The highlight of Archer’s design is the sweeping double staircase in the Oak Entrance Hall. 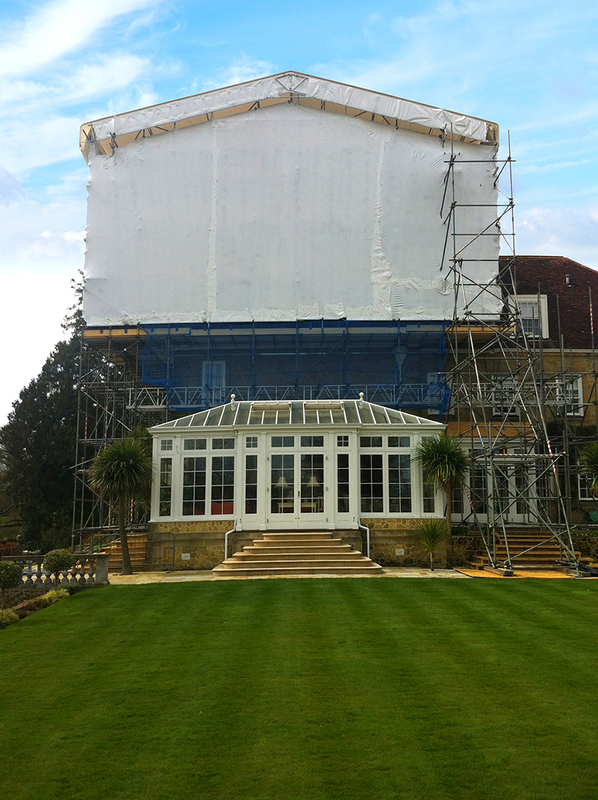 The manor has recently undergone full renovation including roof replacement. The drone footage below shows the sheer scale of the operation which required over 200 tonnes of weight to keep the HAKI roof and external scaffold secure without drilling into the existing building. The base support structures and access staircase were constructed using our Cuplock System. The spine beams were formed with 10 lines of 750mm aluminium beams. The main access scaffold was erected from traditional tube & fittings allowing full access to this uniquely shaped equipment. 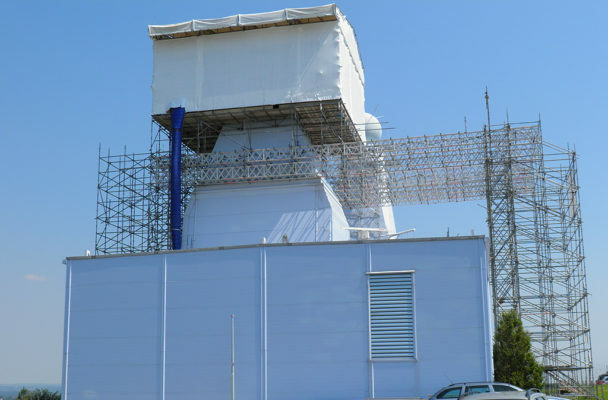 Finally a Hakitec 750 Duo-Pitched Roof was added to the access structure together with shrink wrapping to provide complete protection to the radar during the refurbishment. 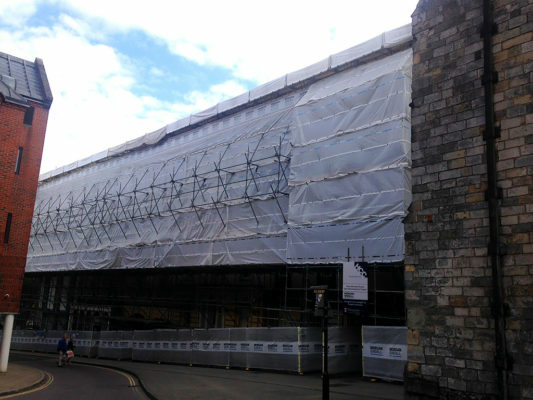 RBS started work on Hampshire County Council’s head office in Winchester in 2016. 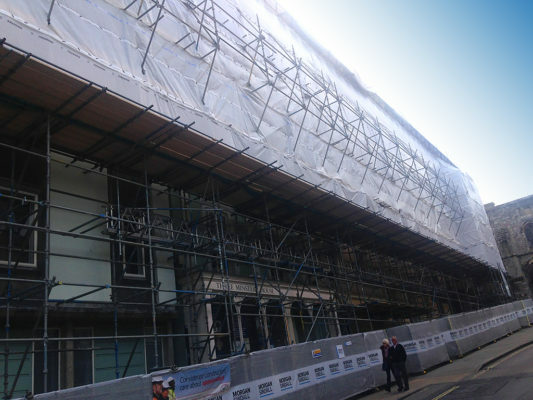 The offices underwent major roof works and renovations that required a 60m by 25m HAKI TEK 750 roof and external scaffold. 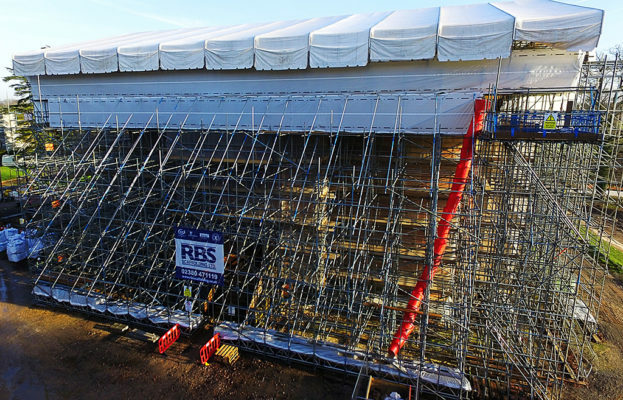 RBS used the Cuplock system scaffold to carry out this project. 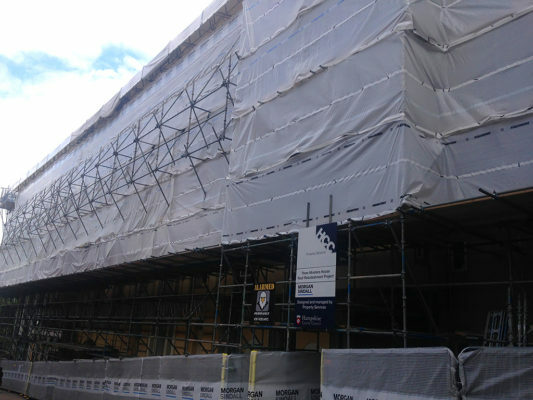 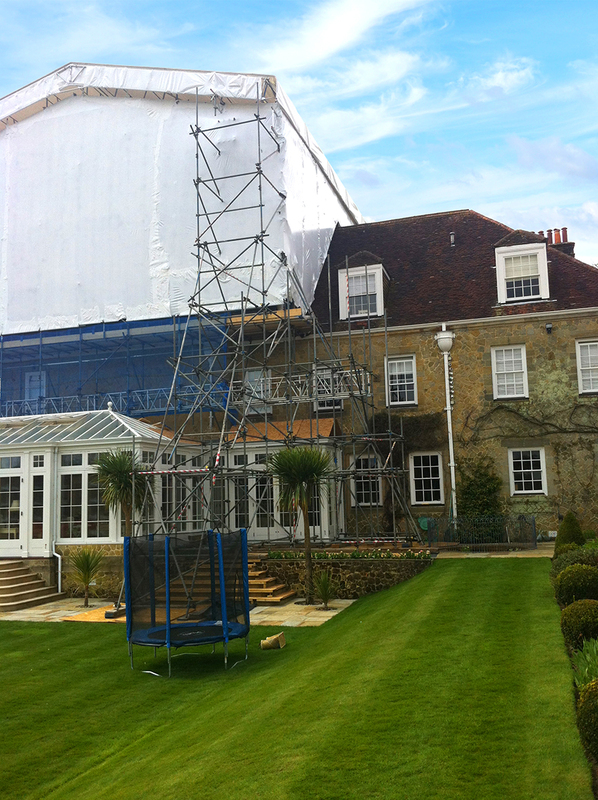 RBS Scaffolding undertook this project at Woolbeding Glebe for E A Chiverton. 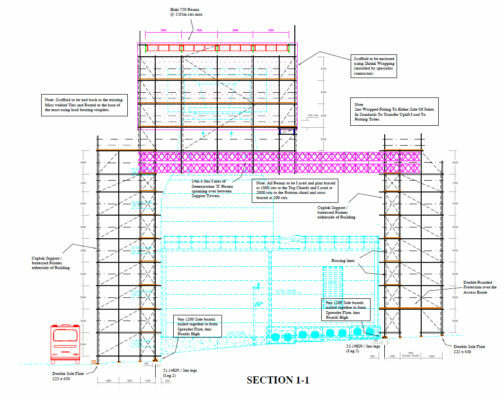 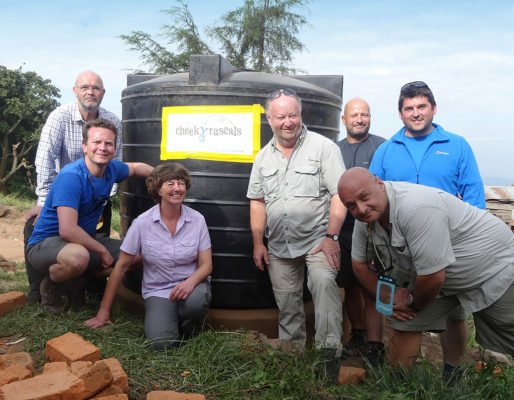 The challenge was to complete the design and build within a tight programme to ensure access was available for the bat inspector. If the deadline had been missed the works would have been delayed by 6 months. 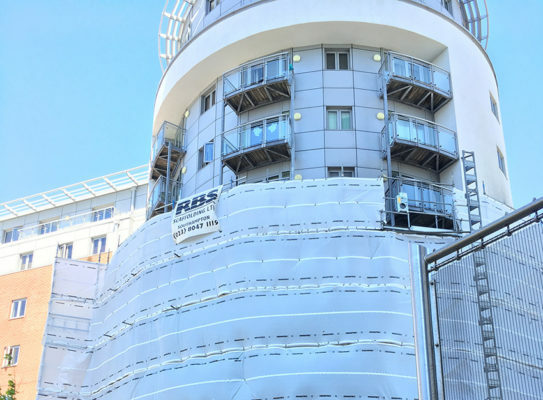 RBS Scaffolding committed the necessary resources with teams working weekends and through the bank holiday the project build was completed on budget and time.